RHAPSODY 950 Platinum Tsavorite Garnet (Rnd) Half Eternity Band Ring 1.000 Ct, Platinum wt 5.56 Gms. Rhodolite Garnet (Ovl), Natural Cambodian Zircon Ring in Platinum Overlay Sterling Silver 3.250 Ct.
January’s very own deep and rich gemstone is Garnet. Mined in a rainbow of colours from red, yellow, pink, orange, green, purple, brown and black, this gemstone is considered to be a great gift to bond in friendship and trust. Its more popular colours are the pomegranate red and exotic green. Regal and tasteful, our mesmerizing array of these rings presents deeply detailed designs that you won’t find anywhere else. Below are the more popular and bestselling designs of Garnet Rings in UK. The entrancing hues of garnet contrast beautifully with the luxury of gold. Our large garnet rings in gold have a classic flair about them that cannot be seen anywhere else. Moulded in coveted designs, these keepsakes look brilliant, be it in the traditional charm of yellow gold, posh luxury of white gold, or darling femininity of rose gold. The multi-hued gem looks fantastic no matter which tone of gold it is embellished in. Nestling like a speck of the star, garnet looks absolutely ravishing in gentle spells of silver. This Birthstone of January settles beautifully in the silver mouldings. The pristine glamour and shine of silver complement the transparent clarity of the gem beautifully. In fact, if you’re looking for a premium touch, you may also find pieces that have been plated with different posh metals, too, like gold (yellow, white, rose,) platinum, rhodium, and more. Move over diamonds, it’s time for the colours to shine! No more are diamonds the requirement of an engagement ring, this era is all about colours. To bring you the coloured bling, our engagement rings boast of designs that you won’t have seen anywhere else. In fact, if you’re looking for something meaningful and classy, then don’t miss out on our Garnet Eternity Rings in UK. These up-and-coming designs of garnet engagement rings have been quite popular in UK. The fiery glow and hypnotizing colours of garnets look absolutely majestic in the company of the starry sparkle of diamonds. The swoon-worthy contrast enlightens your flair in the most picturesque fashion. Explore our sublime selection rings have been studded with the eternally spectacular diamond in company of these gorgeous garnet hues. In the array, do not miss out on our diamond and garnet eternity rings as they’ve collected quite the wonder of countless. Explore and shop from the fabulous collection that everyone is going to love at first sight. One of the biggest reasons why you ought to shop with us has to do with our quality. Our display of natural garnet rings in UK features the elite and rich grade of the gem. We believe in mining our own stones, eliminating the need of middlemen and offering you the best quality there is. Another reason to shop with us has to do with our pricing. We understand your budget perfectly and love working within it. 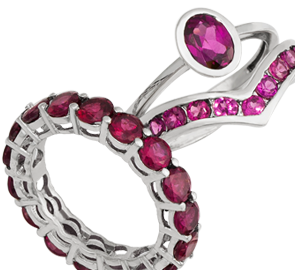 It is why our brilliant beauties in collection of affordable garnet rings online offer an elite grade without having to break the bank!